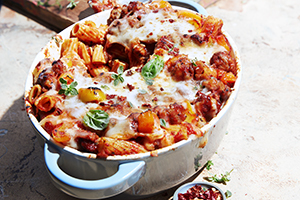 For an easy and delicious family-friendly meal, bake uncooked pasta with sauce and cheese. Squeeze sausage meat out of casings; crumble in large nonstick skillet. Over medium-high heat, cook, stirring constantly to break meat up, until partially cooked, 5 minutes. Add onion, yellow and orange peppers and garlic; cook until meat is no longer pink, 5 minutes. Remove from heat; add basil and red pepper flakes. Stir in tomato sauce. In greased 12 cup (3 L) baking dish, spread half of the pasta. Spoon half of the sauce mixture evenly over pasta. Sprinkle with half of the mozzarella. Repeat with remaining pasta, sauce and mozzarella. Pour 1-1/2 cup (375 mL) water over all. Cover tightly with foil; place dish on rimmed baking sheet. Bake in 400°F (200°C) oven for 1 hour or until pasta is tender. Remove foil, sprinkle with asiago cheese and bake for 5 minutes. Let stand for 10 minutes before serving. Garnish with basil, thyme and red pepper flakes. Tip: Tubular medium size rigatoni works well in this recipe but other medium sized pasta such as shells can be used.